William Gillette was an American actor and playwright, born in 1853. He portrayed Sherlock Holmes more than 1,000 times on stage, but only once on film. This film had been lost for almost 100 years, and was recently discovered in a film archive in Paris, France. Great news for Sherlockians! The re-discovered film has been restored and the film made its US debut in San Francisco in May. Among the attendees was Sonia Fetherston BSI, award-winning author. 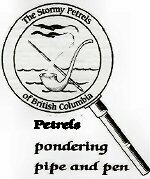 The Stormy Petrels are honoured and very pleased to have Sonia in Vancouver to treat us, and anyone wishing to join us, to a talk about William Gillette and the re-discovered and newly-restored film. She will answer questions on its actors, when and where it was made, how it came to be lost and how it came to be found and everything in between. The talk will take place at our usual meeting location, Hampton Place (UBC) at 7:00 pm on Thursday, July 16th. Please join us and meet Sonia and learn all about William Gillette and his film.